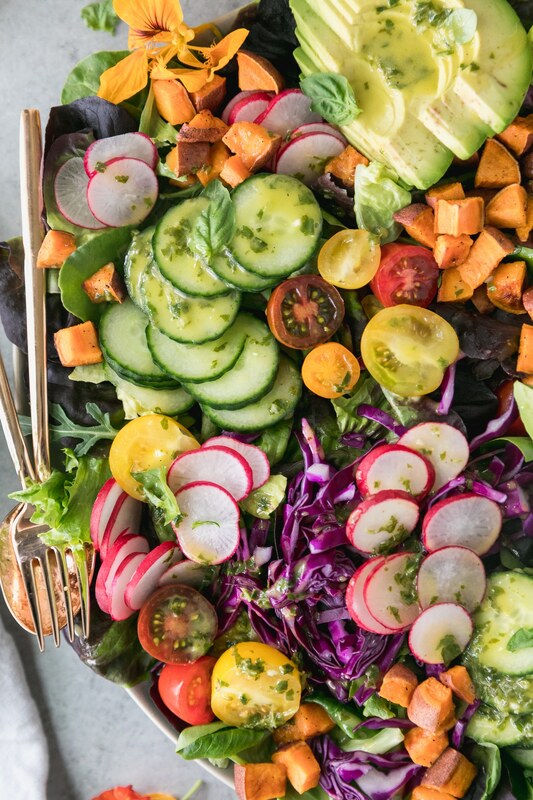 This Farmers Market Salad is filled with lots of fresh veggies, roasted sweet potato, avocado, and a delicious lemon honey basil dressing! It’s SO fresh, and you can throw whatever veggies you love in it! It’s meant to be made with whatever you have on hand, or whatever looks good at the farmer’s market! The perfect light summer meal! This salad has been on repeat in my house for the past few weeks. One of the first days it got really warm outside, I was craving alll of the fresh things. I had a ton of produce in the fridge that needed to be used up, and I had some leftover basil from a pesto I had made earlier, and this salad was born! I actually shared it on my Instagram stories, and many of you wanted the recipe! So here we are. These are the kind of meals I eat on the regular, even in the winter. 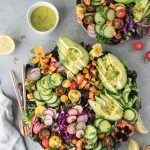 I like my salads to be super loaded and crunchy with lots of fresh veggies, and a super flavorful dressing. I cook super seasonally, so in the fall, I might use pears and roasted butternut squash, and in the winter, I might use pomegranate, blood oranges, shaved brussels, and whatever else is in season. 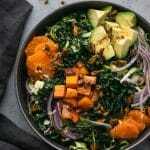 I feel my best when I get in as many veggies as possible, so my lunches, and sometimes dinners look a lot like this! And the best part is, it’s SO simple. The most time consuming part is chopping all of the veggies. And call me crazy, but I actually find that kind of therapeutic. I love taking the time to enjoy the process of making a meal. Sometimes a luxury, but whenever I do have the time to actually TAKE my time, I love it. This dressing. Omg. It’s the epitome of summer. So so fresh. It’s just freshly squeezed lemon juice, basil, a little honey, olive oil, garlic, a touch of dijon, salt, and pepper. It’s something I’ll be keeping in the fridge all summer long. 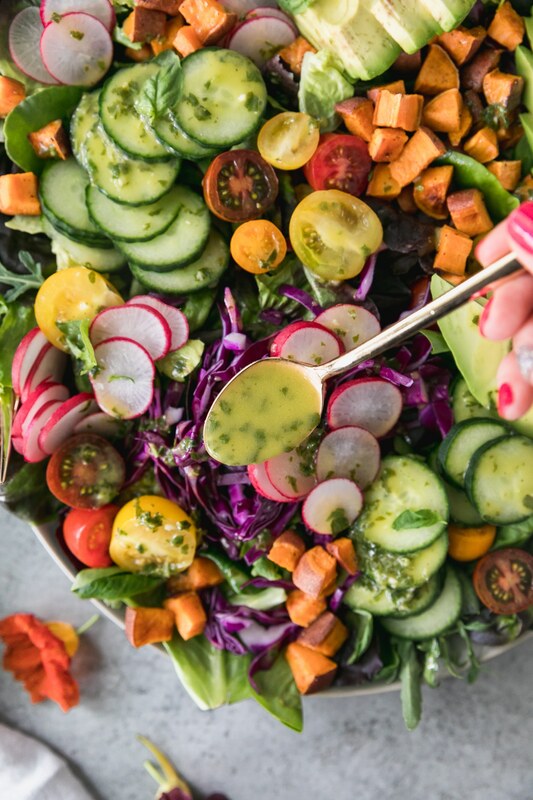 Aside from being delicious drizzled on this salad, it would be so great drizzled on mozzarella and tomatoes, or even soaked up with some grilled bread. You seriously cannot go wrong with lemon, basil, olive oil, and garlic. I will say you want to use a super high quality, extra virgin olive oil for this dressing. The ingredients in this are so simple, so you want to get the best quality to let everything shine! It’s usually something like quinoa, lentils, roasted sweet potatoes, or rice. It just makes a salad so much better! I usually add some protein to this salad too. It’s great with grilled chicken, salmon, or shrimp. You could totally do flank steak too! Flank steak will always make me super nostalgic for summers growing up. My mom made it all the time and it’s one of my favorites to this day! If you need me, I’ll be eating this all summer long. 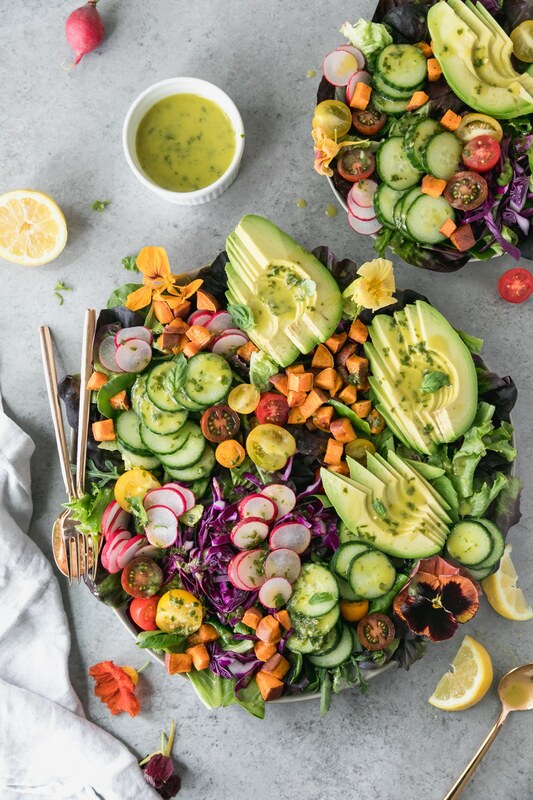 This Farmers Market Salad is filled with lots of fresh veggies, roasted sweet potato, avocado, and a delicious lemon honey basil dressing! It's SO fresh, and you can throw whatever veggies you love in it! It's meant to be made with whatever you have on hand, or whatever looks good at the farmer's market! 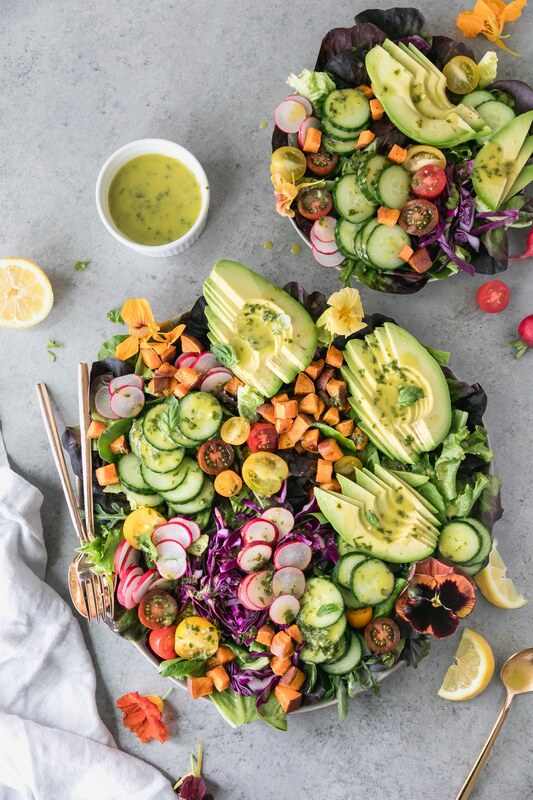 The perfect light summer meal! Preheat oven to 400℉. Line a large rimmed baking sheet with parchment paper. Add the sweet potatoes, olive oil, and desired amount of salt and pepper. Toss to coat. Bake for 25 minutes or until tender and golden. While potatoes are roasting, make the dressing. 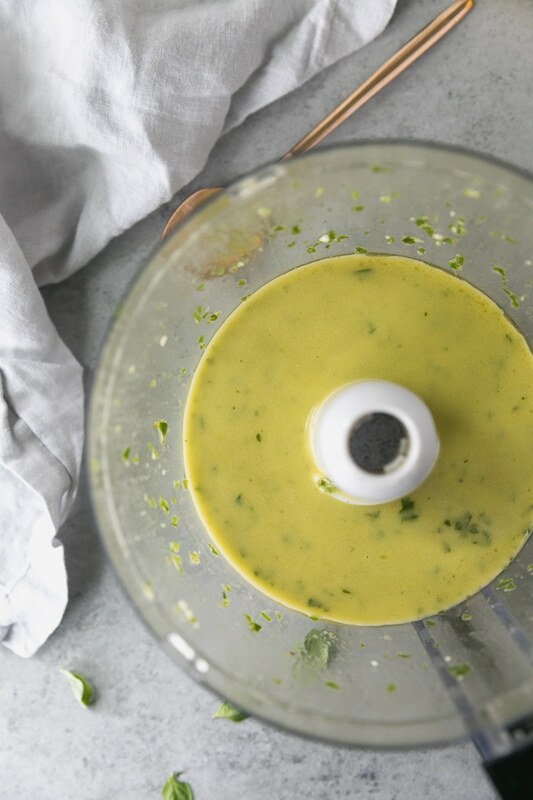 Add the lemon juice, basil, garlic, dijon, honey, olive oil, salt, and pepper to a food processor or blender and blend until smooth. Season to taste with additional salt and pepper if desired. 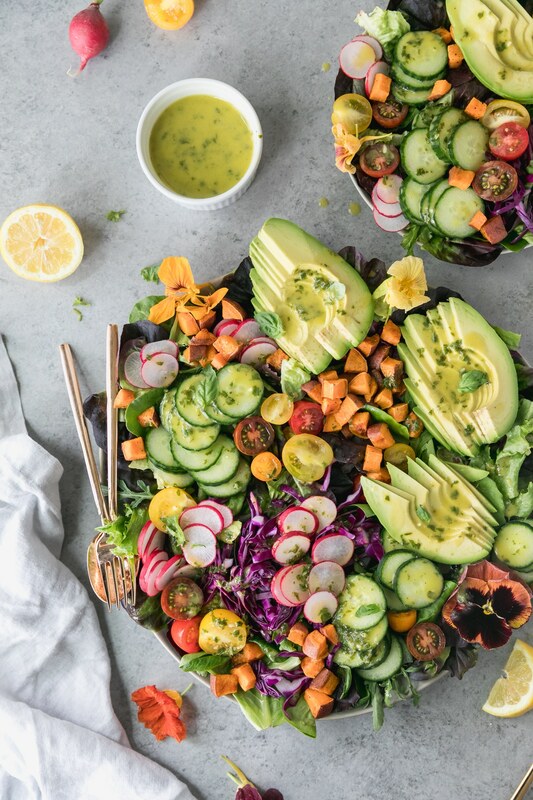 To assemble the salad, place greens on a large platter or in a large bowl. Season the greens with salt and pepper and toss. 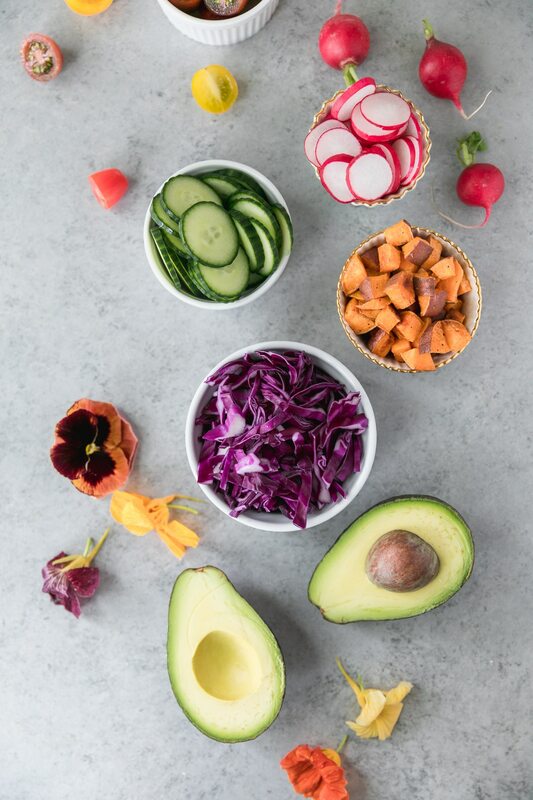 Top with roasted sweet potatoes, red cabbage, cherry tomatoes, radishes, cucumber, and avocado. Garnish with fresh basil leaves and drizzle with desired amount of dressing. Serve immediately! *I used a mixture of spring mix and baby butter lettuce, but you can use whatever you like! The spring mix with herbs added in would be wonderful here too. 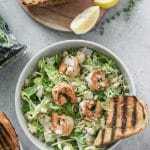 *I often add grilled chicken, salmon, or shrimp to this salad and it's delicious if you're looking for a protein boost! *This recipe is meant to be catered to whatever you have on hand! 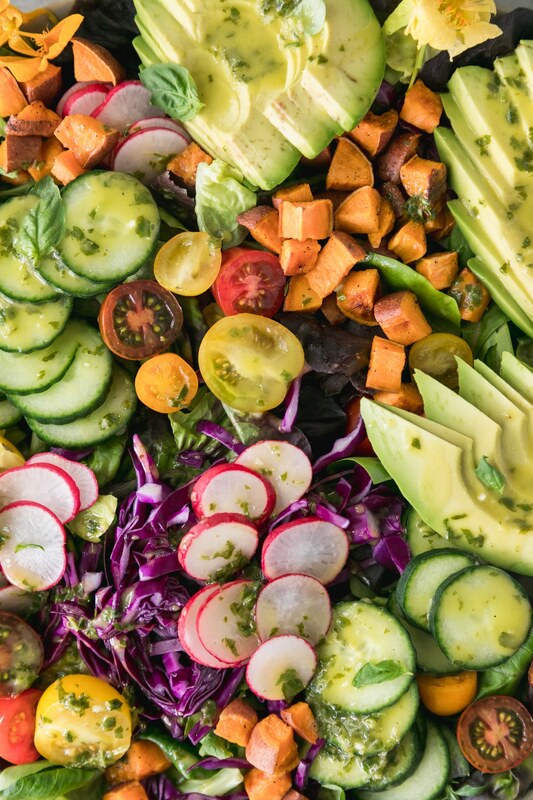 Use whatever veggies look beautiful at the store or farmers market, or whatever needs to be used up in the fridge. You can't go wrong here! 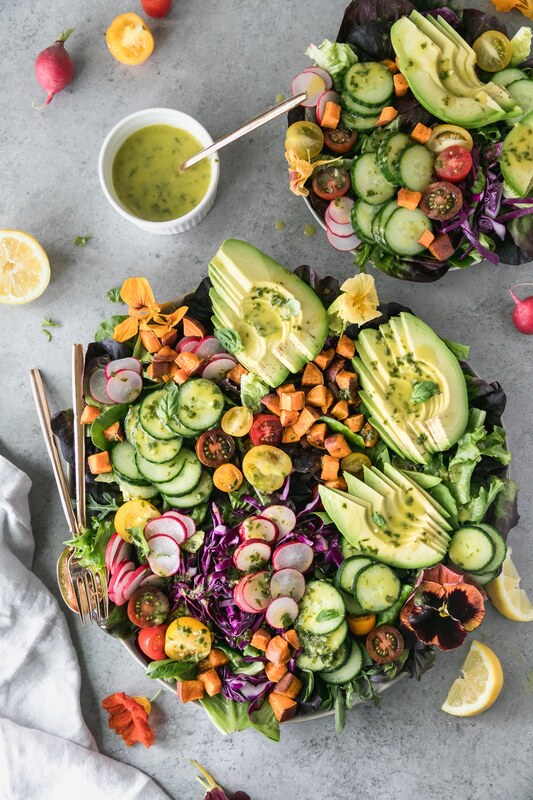 *I added edible flowers to the salad for fun and to make it pretty, but that is totally optional. It's a nice touch if you're serving it to guests though! I find mine in the produce section at the grocery store! Just wanted to stop by to tell you that this photo stopped me in my tracks. Absolutely gorgeous!! !